A new report from the USDA has found what doctors and health practitioners alike have known for awhile; Americans are eating far too many fats, sugars, and grains. The new report tracked how food consumption patterns have changed in the US over the last 40 years by examining how many fruits, veggies, grains, proteins, dairy, added fats and oils, and added sugars and sweeteners, per capita, were available. Check out this chart from the USDA. 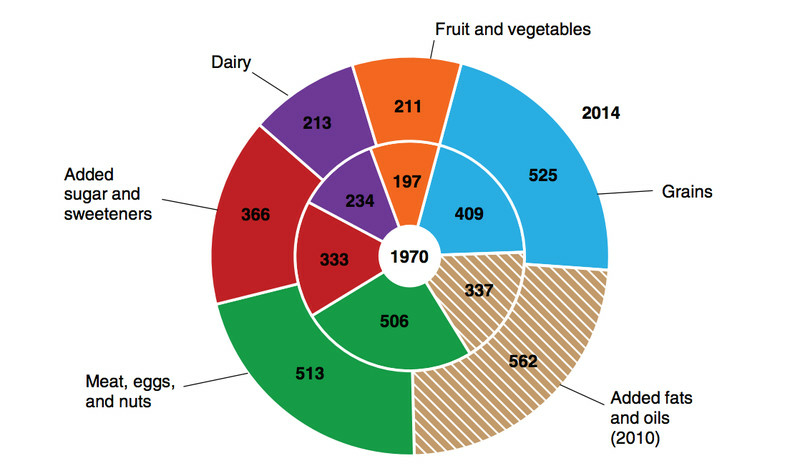 The inner ring shows calories by food group from the 1970’s, while the outer ring data is from 2014. It’s great to see Americans starting to take more of an active role in their food consumption- we are certainly more educated on food in 2017 than we’ve ever been. However, we are still eating TOO MUCH of the things we should be consuming less of and the consequences of that speak volumes- obesity rates have tripled. I changed my diet years ago and have never felt better. To read my story, click here.